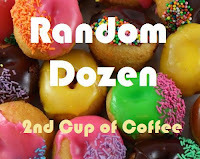 Time again for Random Dozen (everybody say "HEY"!)! I don't have one. I only remember going to a fair/carnival a couple of times, and have no idea what I ate. Last night: fried calamari. Too chewy for my taste. Also last night: Lambrusco. Wonderful. Did y'all know that you can get wine samples for 25 cents at Olive Garden? We had our monthly "special ed girls' dinner out" last night at Olive Garden. Good times, good conversation, and good food! Is this a "good sigh" or a "bad sigh"? Bad sigh: my boys doing something they aren't suppose to be doing. Good sigh: a really good dessert! I do know how old I am, and I claim to be 29. Which is a miracle since I have college-aged kids! If it were life or death, yes. If it wasn't life or death, it would depend on the circumstance. I'm a firm believer in taking responsibility for your actions. Probably something that had to do with music. Tell them that she's my friend. This has happened before, so I know exactly what I would do. Words of Affirmation. I'm not much into the huggy-feely thing. Gifts are a good thing, but it makes me uncomfortable to receive them. Love to give them, though! If fried calamari is too chewy, then it's not good calamari. I love *good* fried calamari, but it has to be really good (fresh) or it's AWFUL. I laughed at "special ed girls night out"...I think you probably need to use a different name when you make the reservation, or they won't serve you those .25 tastes of wine! Ha ha! Seriously, enjoyed your answers! Celebrate - you're halfway through the week! So speech therapists=words are our love language : ) I'm thinking there is a reason we went into that field! Those were good questions and answers. I'm craving some Olive Garden right now! I agee on the calamari end. Tried it once - dislike the texture. I'm married to a poli sci major...I have to know my politcs! Glad you enjoyed your girls' night. I treasure mine. HEY!!! Money is my fave gift too!! I think calamari tastes like a silly band looks!! See you tomorrow!! I wish it was only 20 pound for me, it's more like 60! I do white gold and love it. Hope your week is going well. i loce calamari. give me money any time. i bet i have more pounds to lose than yourself.